Chinese-American director Cathy Yan's directorial debut of "Dead Pigs" saw its China premiere in Beijing on Wednesday. The film offers up dark humor in a realistic drama intertwining the lives of five lonely and trapped individuals, while reflecting aspects of modern China. The film is based on a true story of dead pigs found mysteriously floating in a river in China. After Yan read the story in the news, she decided to pursue the story, shooting it in Shanghai and completing it in New York with the help of funding from Chinese investors such as Alibaba Pictures. Renowned Chinese director Jia Zhangke is the film's executive producer. "It's very fateful for me to meet Cathy. She showed me the test filming footage and talked to me for just ten minutes, then I decided to get on board," Jia Zhangke remembered. Born in China and raised in Hong Kong and Washington, D.C., Yan previously worked as a reporter for the Los Angeles Times and Wall Street Journal in America and China before turning to filmmaking, thus giving her a unique perspective and experiences. Jia further explained his interest in producing the film: "I feel that through this kind of real event, which is a subject that I'm very familiar with, she can portray the various faces and vicissitudes of life in the transition period of modern China. I was impressed she has so many insights." Vivian Wu, a veteran Chinese actress who has starred in many classics such as "The Last Emperor" and "The Soong Sisters," and as one of People magazine's 50 Most Beautiful People in the World in 1990, presents an attractive yet challenging character in "Dead Pigs." "I think that she may be the most breakthrough and paradigm-shifting character for me in recent years, " Wu said at the premiere. "She is a woman with flesh and blood, ideals and tempers. She uses her weak power to defend her own home, which actually represents the vibe of a generation." Another highlight of the cast is Mason Lee, son of the world-famous director Ang Lee, who was absent from the premiere. But actress Li Meng, whose character interacted closely with Lee's, mentioned on Wednesday that Lee is a very independent actor. "He came to Shanghai to experience life and work in a restaurant one week before the start of the shooting," she shared. "Dead Pigs" has been winning accolades since it first debut at the Sundance Film Festival, where it won a Special Jury Award for ensemble acting. Other awards include a Ricky Jay Magic of Cinema Award at the 30th Annual Palm Springs International Film Festival (PSIFF), a Grand Jury Prize at the 2018 Dallas International Film Festival, and the New Director's Grand Jury Prize at the 2018 Seattle International Film Festival. Yan was also absent at Wednesday night's premiere because she had something more important to work on: a Harley Quinn DC Extended Universe superhero film based on the comic "Birds of Prey." She is the first-ever Chinese female director selected by Warner Bros. to helm a superhero film, due to her outstanding directorial and storytelling skills displayed in "Dead Pigs." "Dead Pigs" will open in Chinese theaters nationwide on Jan. 25. 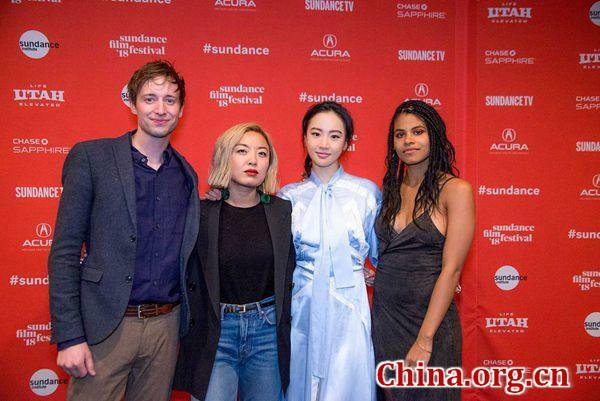 Chinese-American director Cathy Yan's directorial debut, "Dead Pigs," held a China premiere in Beijing on Wednesday, offering the audience a realistic drama with dark humor about five lonely individuals living in modern China.